By the late 1970’s, the toy soon to be known as an “action figure” in the annals of popular culture was about to enter the next phase of its evolution. Mego had dominated the toy aisles through its various licensed properties. The strongest seller in my case had been the World’s Greatest Superheroes line, encompassing both the Marvel and DC Universes. Megos were the gifts of choice for anyone connected with my family. 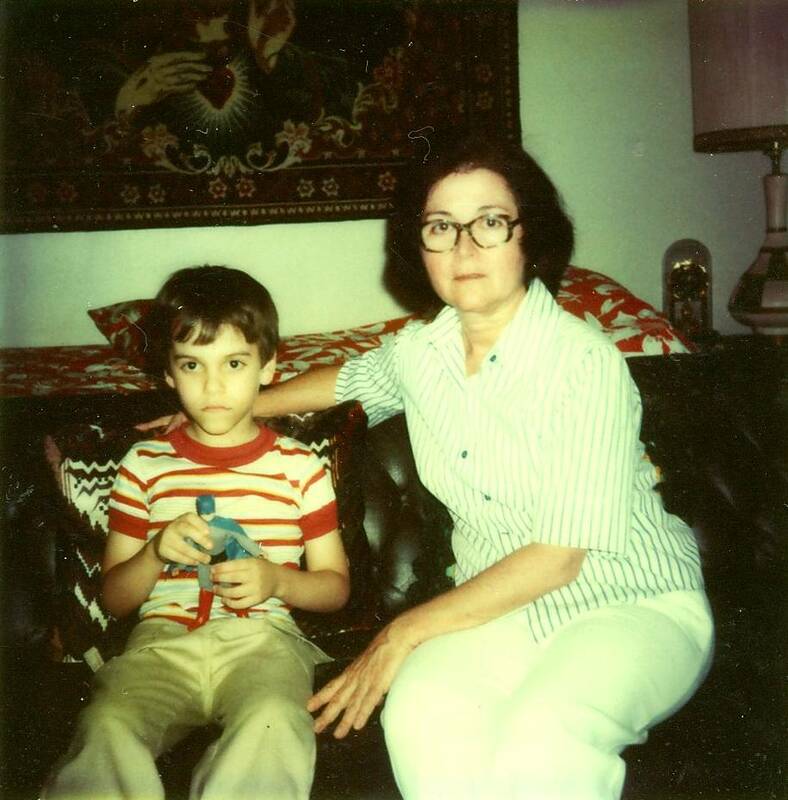 Every two years from 1977 to 1981, my aunt would pick up a Batman figure before our arrival home from Spain during summer vacation. Megos weren’t known for their sturdiness and poor Bats would need a replacement to combat crime by the time I was through with him (which wasn’t more than a couple of months) so my aunt was always ready to spring three or four bucks on my next visit. The thing I enjoyed most about Megos was the card art. (Boxed figures had been phased out by then.) That’s how I discovered and soon appreciated the “checklist factor” or “collect ’em all syndrome” which made action figures so much more fun than other toys. When most kids would just cross out purchased characters on the back, I was busy cutting out the front circles displaying each heroic icon’s face and using them as mini Frisbees! Batman would soon be joined by Spider-Man (just as I started to watch the classic 60’s cartoon) and thanks to a good friend of the family, Captain America. 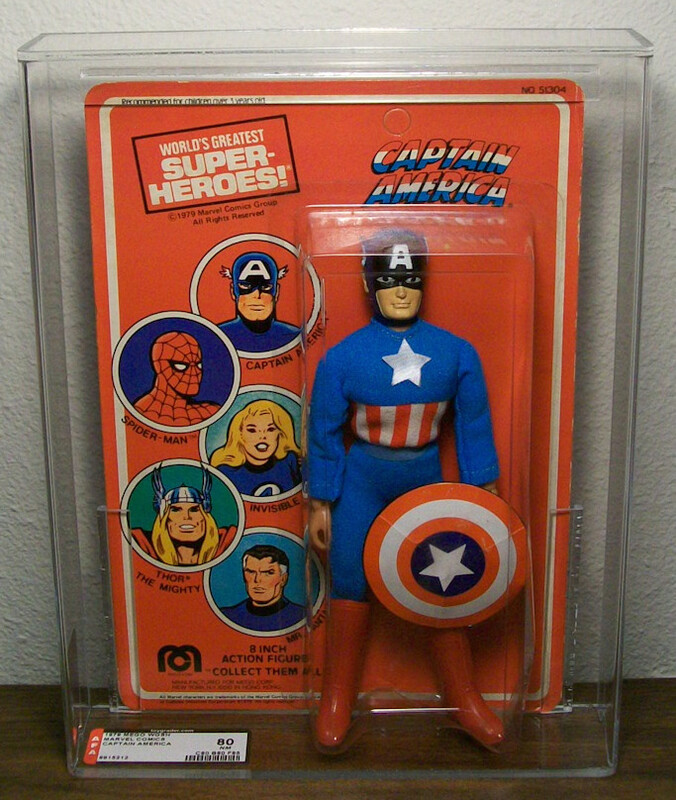 Cap had been my Holy Grail during our 1979 sojourn, the result of an unexpected and tragic event which brought us all much closer. My favorite toys weren't known for their lengthy lifespans. Did you notice that Batman is wearing Cap's boots in this pic? Don't ask where the rest of him went. Mego had experimented with smaller size ranges going back to their 3 3/4” inch Comic Action Heroes series of semi-articulated figures. But the actual game changers in the pocket-sized arena were a small company associated with General Mills cereals and a blockbuster sci-fi movie which took the toy industry by storm: Kenner Toys and Star Wars. I remember my mom asking me to choose from a bunch of tiny (as opposed to 8” inch) figures hanging from the racks at a shopping center, possibly the long-defunct Westminster Mall in Westminster, California. I’ve always loved shiny objects, so I went with a gold robot whose identity was unknown to me aside from the photo on his card front. (Fate conspired to keep me from watching the classic trilogy in theaters.) That robot looked awesome in all his chrome-plated splendor. And did I mention the cross-sell? The card back featured over a dozen different guys to collect! The pictures were way tiny, but my parents knew that the figures were all labeled “Star Wars” so the hunt was on! 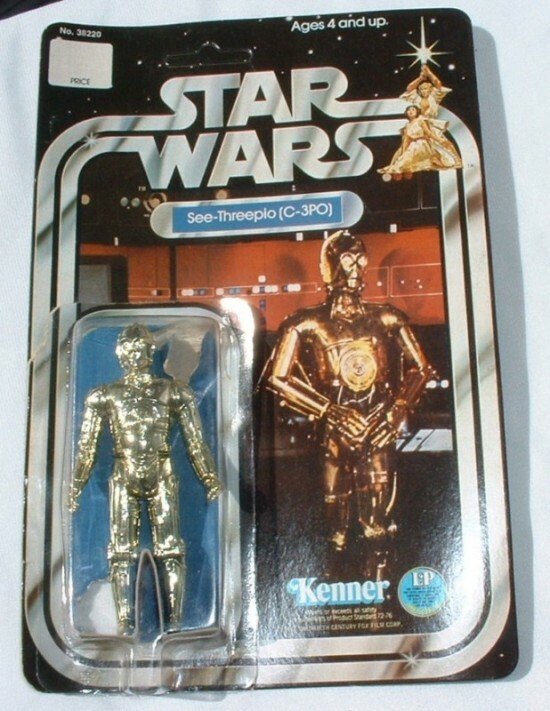 C-3PO was soon joined by his perpetually precocious partner, R2-D2. Even though I had yet to see the actual film and understand English, I somehow figured that the tall, black garbed robot/armored dude was the bad guy here, so he was next. At my local and soon-to-be beloved Toys “R” Us, I enlisted the services of my grandfather. We both combed the aisles looking for the Dark Lord of the Sith, but our efforts came to naught. Then, just as we were reaching the checkout lines, I ran towards a huge bin overflowing with Star Wars figures. And right at the top sat our man Anakin! It seemed he was the only Darth Vader figure to be found that day. Gramps couldn’t believe it. He beamed at my dad and said; “You should see this kid, it’s like he’s got a homing signal or something. He said he’d find this guy and he did. It’s amazing!” My mom remembers her dad’s excitement on that day and still isn’t sure which of us arrived home the happiest. A few nights afterwards, my parents and grandparents made a family excursion to Gemco, a once thriving store chain now pining for the fiords. I remember my dad fooling around with a two-sided mirror which he used to kid Gramps with. One of those “look, you can see all your wrinkles” jives. They always got along. But I was restless for some toy aisle exploration. Grabbing my grandfather’s hand, I hollered something like: “C’mon, let’s see if we can find more space guys!! !” And off we went. Minutes later, I’d found Han Solo, Chewbacca, Ben Kenobi, and Princess Leia. I remember my mom catching up to us just as I was deciding whom to choose. She was pretty much a “one per visit” consumer in those early days but Gramps smiled and insisted on buying all four. ALL FOUR. Wow! I couldn’t believe my luck. Gramps felt that it was the least he could do since we were leaving for Spain again in a few days and he wouldn’t be able to see me for two more years. I remember impatiently opening the figures on our way back. That particular stunt cost me Chewie’s bowcaster as I never found it once we were home. I probably lost it in the car’s back seat or maybe the figure had previously fallen prey to one of the very first Aisle Trolls to roam the Earth. Either way, I was happy! I probably went to sleep like a log that night. It was the evening of August 23rd, 1979. Checking the calendar as I write this essay, it turns out to have been a Thursday. That might explain why I found so many key figures in one outing. I probably woke up early in the morning and watched TV. My parents drove up to L.A. so they could get my mother’s reentry permit done as she wasn’t a nationalized citizen yet. (She needed it to move around between Spain and the States.) Gramps asked my grandmother if she needed something from the local grocer, Iberoamerica Market. (You’ll read more about it in future columns!) It was a small place run by a Galician and frequented by all the exiled Cuban men in town. (Think Archie Bunker’s Place.) Gramps would help the owner bag groceries as the group chatted and enjoyed a couple of beers, even cooking something up in the kitchen from time to time. It was only a few minutes away on his bicycle. Gramps never drove but he dearly loved his bike. He never made it. Just as he was set to make one final left turn, a lady driver struck his bike from behind with her car. Gramps hit the pavement hard, but he apparently thought he was okay. The ambulance took him away. My parents were back by then and my mom was washing some dishes by the kitchen window when two guys dressed like Ponch and Jon parked in front of our apartment. She knew in her heart why they were there the moment she noticed them. I remember my grandma and aunt crying out loud with my mom on the sidewalk as the patrolmen gave us the news. They rushed to the hospital while I stayed behind with someone since kids weren’t allowed as visitors back then (or so I was told.) Some of the others talked with Gramps, who was still sitting on the stretcher. He said he felt normal. Then his ear began to bleed and he lost consciousness. Within minutes, he’d lapsed into a coma due to a brain hemorrhage. In the early morning hours of August 30th, 1979, he died. Guys, if you’re gonna ride, always wear a helmet. 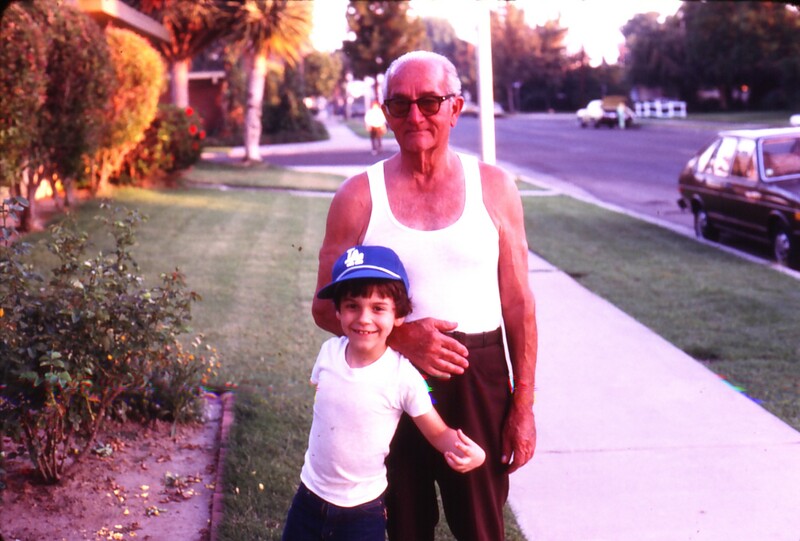 Gramps never did for some reason, even though Anaheim wasn’t the quiet Cuban town he’d once lived in. This had been his third biking accident. One of our few pics together. An aside: I enjoy great music much as I do toys. Jazz virtuoso Sadao Watanabe's exquisite "Inner Embrace" is the theme of choice for my final days with Gramps in late '79. Soon after Gramps left us, one of his grocery store acquaintances (ironically, the one guy he didn’t like much)Â took up his slack. His name was Arnaldo and he made my life happy during all the years we spent together. He had no grandchildren at the time, so I sort of became his first. His wife and my aunt were already friends and coworkers, so their visits increased to weekly status. We became very close over the next few decades. 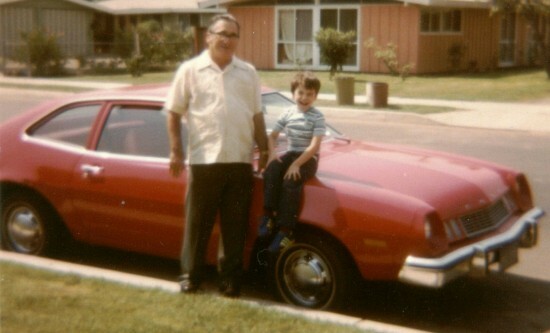 Arnaldo and I got along marvelously and he fully supported my toy collecting habit just like Gramps had done before him. His name was Arnaldo Eugenio Ruiz and he was a GREAT man. My father, my mentor, my loyal companion. By 1981, we were back home to stay. Mego was going out of business around then and rarer carded figures began to show up everywhere. I found a carded Thor at another frequent haunt called Zodys (also long defunct) and spotted Green Arrow at one point but foolishly let him go. My dad got me Aquaman at TRUs because he had been a childhood favorite that we both had in common. I don’t have to tell you that these guys are all worth hundreds of dollars nowadays. Mego cleared out its inventory real fast and the Hulk (along with his often MOC broken limb) had become the lone peg warmer by 1983. I did find the Pocket Super Heroes gift set with Batman, Robin, and the Batmobile on a trip to TRUs. (While looking for an 8” inch Robin, natch!) I also got the die-cast Superman with improved articulation. (Remember those? The boxes were white and they were labeled “limited editions,” if I recall.) But for the most part, that was the end of my Mego collecting days and the company itself. Nobody I know of has simultaneously licensed Marvel and DC characters as action figures since then, although Toy Biz came mighty close for around a year in 1990 through two separate lines. Cap looked SO awesome that I never noticed his red gloves were nowhere to be found. One subtle gal, my grandma. And in case you’re wondering, I never had the original Luke. Bummer. Mego remains the gold standard for superhero figure collectors of the 1970’s. As such, there are many websites which faithfully cover the company’s history. I highly recommend the Mego Museum for all you diehard Mego maniacs and Plaid Stallions for anyone who grew up during the 70’s and wishes to revisit treasured childhood memories. Star Wars collecting virtually defined the hobby of buying and selling action figures. There are hundreds of sites dedicated to all things George Lucas on the Internet, but Rebelscum and Yakface clearly lead the pack. Check out the various blogs on both lines as well. Most are small labors of love and well worth your time. Photos courtesy of an old Polaroid camera and eBay, still the best place for finding lost treasures. What a great blog about the wonder years. This was a bit of an emotional up-and-down (at least for me). I also love how you didn’t edit/enhance the old photos to preserve the nostalgia effect. Thanks, Pete. It does help having faces to match the story and help bring readers closer. I’m glad you liked ’em. What a beautifully written post. Indeed a testimony to how collectors can see so much more in an object than the sum of its parts. Spam protection: Sum of 2 + 12 ?